A new program offering free eye tests and glasses at Victorian schools is set to transform the learning environment of children in prep to year three — up to a third of whom may have unidentified vision problems. 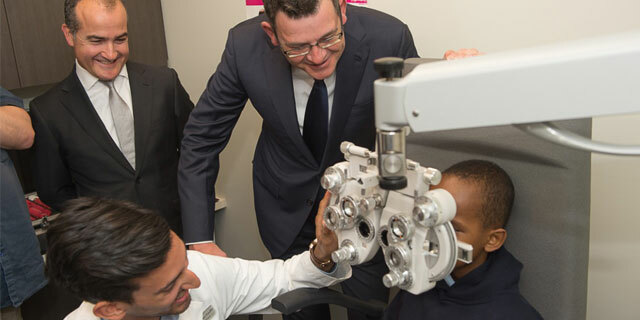 Final-year Optometry students from the University of Melbourne will conduct eye tests at more than 100 schools, as part of the Glasses for Kids program, launched today by the Victorian Premier, Daniel Andrews and Minister for Education, James Merlino. The three-year program is being delivered by the University in partnership with the not-for-profit group State Schools Relief (SSR), and the Department of Education and Training Victoria. The new Dean of the Faculty of Medicine Dentistry and Health Sciences, Professor Shitij Kapur, said common problems in this age group included long-sightedness, turned eyes and colour vision problems. “The importance of both good education and good health to a child’s future cannot be underestimated,” Professor Kapur said. At one school in a trial conducted earlier this year, 330 children were tested and 125 were found to need glasses. Associate Professor Daryl Guest, the clinical director at University of Melbourne Eyecare, said final-year Optometry students were excited to be part of a major public health initiative that would help children and their teachers. “For many of these kids, simply prescribing glasses has completely transformed their experience of school, improving their concentration and behaviour. This article was first published on the Melbourne Newsroom.